If you want to be promptly ignored, the best way to do it is to try to release a new DAW. Aside from the fact that even most musicians don’t know what the word “DAW” is (hint: it’s a big program that puts all your computer production, mixing, and recording stuff in one place), you’re up against the likes of Cubase, Ableton Live, Pro Tools, DP, SONA… sorry, I get tired even just doing the list. Here’s how to get some attention: be the first DAW to add Celemony’s crowd-awe-ing direct pitch modification, which lets you change the pitch of polyphonic recorded audio, right in the software. 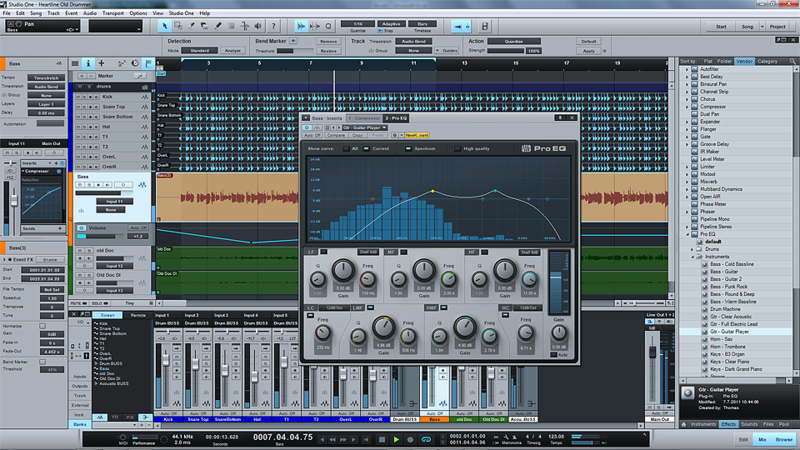 That’s what PreSonus’ Studio One version 2 does. It’s something we’ve been waiting for ever sense we first saw Melodyne. You can now, without the restrictions of a plug-in, edit recorded audio and change pitch without having to leave your DAW, all in “one click” according to PreSonus. PreSonus isn’t the first to add transient detection, editing, groove “extraction,” and groove quantization – features that let you make rhythmic modifications to recorded audio. Indeed, these features, once exotic selling points, have almost become prerequisites as DAWs leap-frog one another. But as PreSonus adds these features, they promise more seamless editing: to quantize, just group some drum tracks, and quantize; to do groove extraction, just drag and drop. Some tools require more steps; others promise this kind of seamless operation but don’t always work perfectly. This sounds like one to test – made, again, more interesting by the pitch editing changes. Now, I have only one concern: Melodyne “Essential” is included, and only with the full-blown “Professional” edition; I hope we see the same degree of integration for people who buy Melodyne DNA, the all-stops-pulled “direct note access” editing. WIthout it, the integration is nice, but with it, I might even use the phrase I hate – “game changer.” Updated: Yep, DNA works. That’s a pretty big deal. Other DAWs have “pitch correction” – but I already see many readers share my comparative disinterest in just correcting pitch. Being able to directly edit recorded sounds gets really interesting, by comparison. And whatever other tools may claim, I haven’t seen anything that works quite like DNA, yet. What you need is just a copy of Studio One “Professional,” and a purchased copy of DNA. Comping (making finished tracks out of the best bits of different takes) without switching tools – something I’ve found annoying elsewhere. Edit more than one MIDI track at once. New amp models, convolution-based cabinet models, convolution reverb, and an IR Maker for adding your own impulses. So, the pieces are very similar to what you see elsewhere; PreSonus’ potential here may be how they put it together. I’m certainly ready to have another rival. I’m always suspicious that fancy pitch and rhythm correction are just there to help you try to perfect imperfect performances. That’s something that can erase the human feel of good musicians, and make for soul-crushingly long editing sessions with bad musicians. (I’ve heard some horror stories on the latter.) But they can also be powerful remix and creative tools, especially if the workflow is improved, and that’s where they can be exciting. Uh… no. If you send Studio One to planet Mars, then you can make this sort of claim. So, the hyperbole beast rears its ugly head. But I’ll say this: PreSonus, who entered a category in which it’s nearly impossible to get anyone’s attention, you’ve got everybody’s attention now. And if you pulled it off, Studio One 2 could be the sleeper hit of this week’s AES show. Because since numerous DAWs let you record, edit, mix, master, and distribute your music in an integrated and truly professional environment, on this crowded planet Earth, you do have to do something to stand out. Now, here we’re getting to the point – behind the vague statement is something that gets interesting (i.e., how it’s integrated with the song editor). I still stand by what I said, though – Record, specifically, could claim a fair degree of integration of the mastering tools within their own (different) paradigm. Anyway, I suspect users don’t need to get planetary with this; they care about how it work specifically in their own workflow. So stay tuned as we test this.